Rand Aldo Leopold was born in Burlington, Iowa, on January 11, 1887. His father, Carl Leopold, was a businessman who made walnut desks and was first cousin to his wife, Clara Starker. Charles Starker, father of Clara and uncle of Carl, was a German immigrant, educated in engineering and architecture. Rand Aldo was named after two of his father's business partners—C. W. Rand and Aldo Sommers—although he eventually dropped the use of "Rand". The Leopold family included younger siblings Mary Luize, Carl Starker, and Frederic. Leopold's first language was German, although he mastered English at an early age. Aldo Leopold's early life was highlighted by the outdoors. Carl would take his children on excursions into the woods and taught his oldest son woodcraft and hunting. Aldo showed an aptitude for observation, spending hours counting and cataloging birds near his home. Mary would later say of her older brother, "He was very much an outdoorsman, even in his extreme youth. He was always out climbing around the bluffs, or going down to the river, or going across the river into the woods." He attended Prospect Hill Elementary, where he ranked at the top of his class, and then, the overcrowded Burlington High School. Every August, the family vacationed in Michigan at the forested Les Cheneaux Islands in Lake Huron, which the children took to exploring. In 1900, Gifford Pinchot, who oversaw the newly implemented Division of Forestry in the Department of Agriculture, donated money to Yale University to begin one of the nation's first forestry schools. Hearing of this development, the teenaged Leopold decided on forestry as a vocation. His parents agreed to let him attend The Lawrenceville School, a preparatory college in New Jersey, to improve his chances of admission to Yale. The Burlington High School principal wrote in a reference letter to the headmaster at Lawrenceville that Leopold was "as earnest a boy as we have in school... painstaking in his work.... Moral character above reproach." He arrived at his new school in January 1904, shortly before he turned 17. He was considered an attentive student, although he was again drawn to the outdoors. Lawrenceville was suitably rural, and Leopold spent much time mapping the area and studying its wildlife. 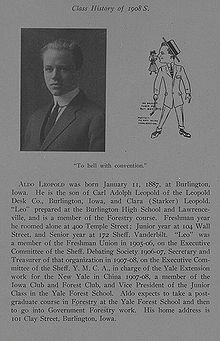 Leopold studied at the Lawrenceville School for a year, during which time he was accepted to Yale. Because the Yale School of Forestry granted only graduate degrees, he first enrolled in Sheffield Scientific School's preparatory forestry courses for his undergraduate studies. While Leopold was able to explore the woods and fields of Lawrenceville daily, sometimes to the detriment of his studying, at Yale he had little opportunity to do so; his studies and social life engagements made his outdoor trips few and far between. In 1909, Leopold was assigned to the Forest Service's District 3 in the Arizona and New Mexico territories. At first, he was a forest assistant at the Apache National Forest in the Arizona Territory. In 1911, he was transferred to the Carson National Forest in northern New Mexico. Leopold's career, which kept him in New Mexico until 1924, included developing the first comprehensive management plan for the Grand Canyon, writing the Forest Service's first game and fish handbook, and proposing Gila Wilderness Area, the first national wilderness area in the Forest Service system. On April 5, 1923, he was elected an associate member (now called "professional member") of the Boone and Crockett Club, a wildlife conservation organization founded by Theodore Roosevelt and George Bird Grinnell. In 1924, he accepted transfer to the U.S. Forest Products Laboratory in Madison, Wisconsin, and became an associate director. In 1933, he was appointed Professor of Game Management in the Agricultural Economics Department at the University of Wisconsin, the first such professorship of wildlife management. He married Estella Bergere in northern New Mexico in 1912 and they had five children together. They lived in a modest two-story home close to the UW–Madison campus. His children followed in his footsteps as teachers and naturalists: Aldo Starker Leopold (1913–1983) was a wildlife biologist and professor at UC Berkeley; Luna B. Leopold (1915–2006) became a hydrologist and geology professor at UC Berkeley; Nina Leopold Bradley (1917–2011) was a researcher and naturalist; Aldo Carl Leopold (1919–2009) was a plant physiologist, who taught at Purdue University for 25 years; and daughter Estella Leopold (b. 1927) is a noted botanist and conservationist who is a professor emeritus at the University of Washington. Today, Leopold's home is an official landmark of the city of Madison. He purchased 80 acres in the sand country of central Wisconsin. The once-forested region had been logged, swept by repeated fires, overgrazed by dairy cows, and left barren. There, he put his theories to work in the field and eventually wrote his best-selling A Sand County Almanac (1949), finished just prior to his death. Leopold died of a heart attack while battling a wild fire on a neighbor's property. Early on, Leopold was assigned to hunt and kill bears, wolves, and mountain lions in New Mexico. Local ranchers hated these predators because of livestock losses, but Leopold came to respect the animals. He developed an ecological ethic that replaced the earlier wilderness ethic that stressed the need for human dominance. His rethinking the importance of predators in the balance of nature has resulted in the return of bears and mountain lions to New Mexico wilderness areas. By the early 1920s, Leopold had concluded that a particular kind of preservation should be embraced in the national forests of the American West. He was prompted to this by the rampant building of roads to accommodate the "proliferation of the automobile" and the related increasingly heavy recreational demands placed on public lands. He was the first to employ the term "wilderness" to describe such preservation. Over the next two decades, he added ethical and scientific rationales to his defense of the wilderness concept. In one essay, he rhetorically asked, "Of what avail are forty freedoms without a blank spot on the map?" Leopold saw a progress of ethical sensitivity from interpersonal relationships, to relationships to society as a whole, to relationships with the land, leading to a steady diminution of actions based on expediency, conquest, and self-interest. Leopold thus rejected the utilitarianism of conservationists such as Theodore Roosevelt. By the 1930s, Leopold was the nation's foremost expert on wildlife management. He advocated the scientific management of wildlife habitats by both public and private landholders rather than a reliance on game refuges, hunting laws, and other methods intended to protect specific species of desired game. In his 1933 book Game Management, Leopold defined the science of wildlife management as "the art of making land produce sustained annual crops of wild game for recreational use." But, as Curt Meine has pointed out, he also considered it to be a technique for restoring and maintaining diversity in the environment. Leopold's nature writing is notable for its simple directness. His portrayals of various natural environments through which he had moved, or had known for many years, displayed impressive intimacy with what exists and happens in nature. He offered frank criticism of the harm he believed was frequently done to natural systems (such as land) out of a sense of a culture or society's sovereign ownership over the land base – eclipsing any sense of a community of life to which humans belong. He felt the security and prosperity resulting from "mechanization" now gives people the time to reflect on the preciousness of nature and to learn more about what happens there; however, he also wrote, "Theoretically, the mechanization of farming ought to cut the farmer's chains, but whether it really does is debatable." This sounds simple: do we not already sing our love for and obligation to the land of the free and the home of the brave? Yes, but just what and whom do we love? Certainly not the soil, which we are sending helter-skelter down river. Certainly not the waters, which we assume have no function except to turn turbines, float barges, and carry off sewage. Certainly not the plants, of which we exterminate whole communities without batting an eye. Certainly not the animals, of which we have already extirpated many of the largest and most beautiful species. A land ethic of course cannot prevent the alteration, management, and use of these 'resources,' but it does affirm their right to continued existence, and, at least in spots, their continued existence in a natural state. In short, a land ethic changes the role of Homo sapiens from conqueror of the land-community to plain member and citizen of it. It implies respect for his fellow-members, and also respect for the community as such. 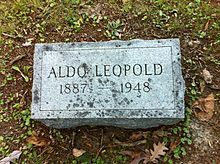 The Aldo Leopold Foundation of Baraboo, Wisconsin, was founded in 1982 by Aldo and Estella Leopold's five children as a 501(c)3 not-for-profit conservation organization whose mission is "to foster the land ethic through the legacy of Aldo Leopold." The Aldo Leopold Foundation owns and manages the original Aldo Leopold Shack and Farm and 300 surrounding acres, in addition to several other parcels. Its headquarters is at the green-built Leopold Center, where it conducts educational and land stewardship programs. The foundation also acts as the executor of Leopold's literary estate, encourages scholarship on Leopold, and serves as a clearinghouse for information regarding Leopold, his work, and his ideas. It provides interpretive resources and tours for thousands of visitors annually, distributes a curriculum about how to use Leopold's writing and ideas in environmental education, and maintains a robust website and numerous print resources. In 2012, in collaboration with the United States Forest Service, the foundation released the first high-definition, full-length film about Leopold, entitled Green Fire: Aldo Leopold and a Land Ethic for Our Time. The film aired on public television stations across the nation and won a Midwest regional Emmy award in the documentary category. The Aldo Leopold Wilderness in New Mexico's Gila National Forest was named after him in 1980. The Leopold Center for Sustainable Agriculture was established in 1987 at Iowa State University in Ames. It was named in honor of Leopold. Since its founding, it has pioneered new forms of sustainable agriculture practices. The U.S. Forest Service established the Aldo Leopold Wilderness Research Institute at the University of Montana, Missoula in 1993. It is "the only Federal research group in the United States dedicated to the development and dissemination of knowledge needed to improve management of wilderness, parks, and similarly protected areas." The Aldo Leopold Legacy Trail System, a system of 42 state trails in Wisconsin, was created by the state in 2007. An organization, the Leopold Heritage Group, is "dedicated to promoting the global legacy of Aldo Leopold in his hometown of Burlington, Iowa." ^ Bob Hansen. "Bringing up Aldo". Leopold Heritage Group. ^ "Boone and Crockett Club Archives". ^ Leopold Family. "Leopold Family". The Aldo Leopold Foundation. ^ Raitt, RJ (1984). "In Memoriam: A. Starker Leopold" (PDF). Auk. 101 (4): 868–871. doi:10.2307/4086914. ^ Mark Staves and Randy Wayne. (December 3, 2009.) "In Memoriam: A. Carl Leopold". The Lansing Star. Retrieved on February 2, 2010. ^ Susan L. Flader, Thinking Like a Mountain: Aldo Leopold and the Evolution of an Ecological Attitude toward Deer, Wolves and Forests. Madison, Wis.: University of Wisconsin Press, 1974, p. 29. ^ "Ritualizing Big History". Metanexus blog. March 14, 2013. ^ Leopold, Aldo "Thinking Like a Mountain"
^ "Green Fire Film". The Aldo Leopold Foundation. Retrieved January 2, 2018. ^ "About Us". Aldo Leopold Wilderness Research Institute. Retrieved January 2, 2018. ^ "DNR Secretary: Aldo Leopold's legacy alive on renamed trails Find a Wisconsin State Trail. Wisconsin Department of Natural Resources. Retrieved January 2, 2018. ^ "Governor Doyle Names State Trails 'Aldo Leopold Legacy Trail System'". WI Office of the Governor: Media Room. Retrieved January 31, 2010. ^ "State trails now a legacy to Aldo Leopold". (June 5, 2009.) The Capital Times. Retrieved January 31, 2010. Errington, P. L. 1948. 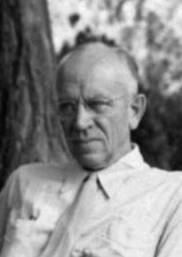 "In Appreciation of Aldo Leopold". The Journal of Wildlife Management, 12(4). Meine, Curt. 1988. Aldo Leopold: His Life and Work. Madison, Wis.: University of Wisconsin Press. ISBN 0-299-11490-2. Court, Franklin E. "Pioneers of Ecological Restoration: The People and Legacy of the University of Wisconsin Arboretum." Madison, Wisconsin: University of Wisconsin Press, ISBN 978-0-299-28664-4. Lutz, Julianne. Aldo Leopold's Odyssey: Rediscovering the Author of A Sand County Almanac. Washington, D.C.: Shearwater Books/Island Press, 2006. Petersen, Harry L. (Fall 2003). "Aldo Leopold's Contribution to Fly Fishing" (PDF). The American Fly Fisher. 29 (4): 2–10. Archived from the original (PDF) on November 29, 2014. Retrieved November 16, 2014. * Sutter, Paul S. 2002. Driven Wild: How the Fight against Automobiles Launched the Modern Wilderness Movement. Seattle: University of Washington press. ISBN 0-295-98219-5. Wikimedia Commons has media related to Aldo Leopold. This page was last edited on 23 April 2019, at 22:57 (UTC).